"Hair color" redirects here. For hair color of horses, see Equine coat color. For hair colorants, see Hair coloring. A variety of the human hair from top left, clockwise: black, brown, blonde, white, red. Two types of pigment give hair its color: eumelanin and pheomelanin. Pheomelanin colors hair orange and red. All humans have some pheomelanin in their hair. Eumelanin, which has two subtypes of black or brown, determines the darkness of the hair color. A low concentration of brown eumelanin results in blond hair, whereas a higher concentration of brown eumelanin results in brown hair. High amounts of black eumelanin result in black hair, while low concentrations result in white hair. Pheomelanin is more bio-chemically stable than black eumelanin, but less bio-chemically stable than brown eumelanin, so it breaks down more slowly when oxidized. This is why bleach gives darker hair a reddish tinge during the artificial coloring process. As the pheomelanin continues to break down, the hair will gradually become red, then orange, then yellow, and finally white. The genetics of hair colors are not yet firmly established. According to one theory, at least two gene pairs control human hair color. One phenotype (brown/blonde) has a dominant brown allele and a recessive blond allele. A person with a brown allele will have brown hair; a person with no brown alleles will be blond. This explains why two brown-haired parents can produce a blond-haired child. However, this can only be possible if both parent are heterozygous in hair color- meaning that both of them have one dominant brown hair allele and one recessive allele for blond hair, but as dominant traits mask recessive ones the parents both have brown hair. The possibility of which trait may appear in an offspring can be determined with a Punnett square. The other gene pair is a non-red/red pair, where the non-red allele (which suppresses production of pheomelanin) is dominant and the allele for red hair is recessive. 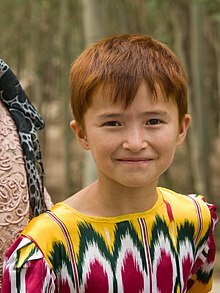 A person with two copies of the red-haired allele will have red hair. The two-gene model does not account for all possible shades of brown, blond, or red (for example, platinum blond versus dark blond/light brown), nor does it explain why hair color sometimes darkens as a person ages. Several gene pairs control the light versus dark hair color in a cumulative effect. A person's genotype for a multifactorial trait can interact with the environment to produce varying phenotypes (see quantitative trait locus). The Fischer–Saller scale, named after Eugen Fischer and Karl Saller [de], is used in physical anthropology and medicine to determine the shades of hair color. The scale uses the following designations: A (very light blond), B to E (light blond), F to L (blond), M to O (dark blond), P to T (light brown to brown), U to Y (dark brown/black) and Roman numerals I to IV (red) and V to VI (red blond). Brown hair is characterized by higher levels of eumelanin and lower levels of pheomelanin. Of the two types of eumelanin (black and brown), brown-haired people have brown eumelanin; they also usually have medium-thick strands of hair. Brown-haired girls or women are often known as brunette. Chestnut hair is a hair color which is a reddish shade of brown hair. In contrast to auburn hair, the reddish shade of chestnut is darker. Chestnut hair is common among the native peoples of Northern, Central, Western, and Eastern Europe. Blonde (or blond for men ) hair ranges from nearly white (platinum blonde, tow-haired) to a dark golden blonde. Strawberry blonde, a mixture of blonde and red hair, is a much rarer type containing the most pheomelanin. Blonde hair can have almost any proportion of pheomelanin and eumelanin, but has only small amounts of both. More pheomelanin creates a more golden or strawberry blonde color, and more eumelanin creates an ash or sandy blonde color. Many children born with blonde hair develop darker hair as they age, with the majority of natural blondies developing a hair color of a dark blonde hue by the time they reach middle age. Pregnancy hormones hasten this process. Natural light blonde hair is rare in adulthood, with claims of the world's population ranging from 2% naturally blonde[self-published source] to 16% in the US. Blonde hair is most commonly found in Northern and Western Europeans and their descendants but can be found spread around most of Europe. 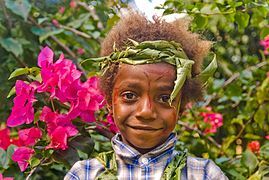 Studies in 2012 showed that naturally blonde hair of Melanesians is caused by a recessive mutation in tyrosinase-related protein 1 (TYRP1). In the Solomon Islands, 26% of the population carry the gene; however, it is absent outside of Oceania. Black hair is the darkest hair color. It has large amounts of eumelanin and is more dense than other hair colors. Auburn hair ranges along a spectrum of light to dark red-brown shades. The chemicals which cause auburn hair are eumelanin (brown) and pheomelanin (red), with a higher proportion of red-causing pheomelanin than is found in average brown hair. It is most commonly found in individuals of Northern and Western European descent. Red hair ranges from light strawberry blond shades to titian, copper, and completely red. It is caused by a variation in the Mc1r gene and is recessive. Red hair has the highest amounts of pheomelanin, around 67%, and usually low levels of eumelanin. At 1–2% of the population, it is the least common hair color in the world. It is most prominently found in the British Isles. Scotland has the highest proportion of redheads; 13 percent of the population has red hair and approximately 40 percent carry the recessive redhead gene. "White hair" redirects here. For the Native American leader, see White Hair. For the fictional character, see Whitehair. Europeans often begin to grow gray hairs in their mid-30s while Asians begin graying in their late 30s, but most Africans retain their original hair color until their mid-40s. Graying is a gradual process; according to a study by L'Oreal, overall, of those between 45 and 65 years old, 74% had some grey hair, covering an average of 27% of their head, and approximately 1 in 10 people had no gray hairs even after the age of 60. Children born with some hair colors may find it gradually darkens as they grow. Many blond, light brown, or red haired infants experience this. This is caused by genes being turned on and off during early childhood and puberty. Changes in hair color typically occur naturally as people age, eventually turning the hair gray and then white. This is called achromotrichia. Achromotrichia normally begins in the early to mid-twenties in men and late twenties in women. More than 60 percent of Americans have some gray hair by age 40. The age at which graying begins seems almost entirely due to genetics. Sometimes people are born with gray hair because they inherit the trait. The order in which graying happens is usually: nose hair, hair on the head, beard, body hair, eyebrows. In non-balding individuals hair may grow faster once it turns gray. 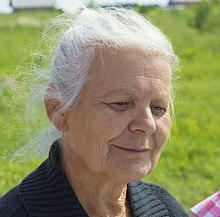 Several genes appear to be responsible for the process of graying. Bcl2 and Bcl-w were the first two discovered, then in 2016, the IRF4 (interferon regulatory factor 4) gene was announced after a study of 6,000 people living in five Latin American countries. However, it found that environmental factors controlled about 70% of cases of hair graying. The change in hair color occurs when melanin ceases to be produced in the hair root and new hairs grow in without pigment. The stem cells at the base of hair follicles produce melanocytes, the cells that produce and store pigment in hair and skin. The death of the melanocyte stem cells causes the onset of graying. It remains unclear why the stem cells of one hair follicle may fail to activate well over a decade before those in adjacent follicles less than a millimeter apart. The anti-cancer drug imatinib has recently been shown to reverse the graying process. However, it is expensive and has potentially severe and deadly side effects, so it is not practical to use to alter a person's hair color. Nevertheless, if the mechanism of action of imatinib on melanocyte stem cells can be discovered, it is possible that a safer and less expensive substitute drug might someday be developed. It is not yet known whether imatinib has an effect on catalase, or if its reversal of the graying process is due to something else. Anecdotes report that stress, both chronic and acute, may induce achromotrichia earlier in individuals than it otherwise would have. 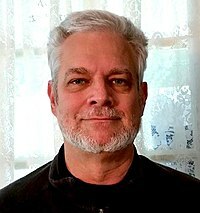 Proponents point to survivors of disasters, such as Titanic survivor Harold Bride, or high-level politicians such as Bill Clinton or Barack Obama. 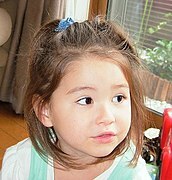 There is some evidence for chronic stress causing premature achromotrichia, but no definite link has been established. It is known that the stress hormone cortisol accumulates in human hair over time, but whether this has any effect on hair color has not yet been resolved. Albinism is a genetic abnormality in which little or no pigment is found in human hair, eyes, and skin. The hair is often white or pale blond. However, it can be red, darker blond, light brown, or rarely, even dark brown. Vitiligo is a patchy loss of hair and skin color that may occur as the result of an auto-immune disease. In a preliminary 2013 study, researchers treated the buildup of hydrogen peroxide which causes this with a light-activated pseudo-catalase. This produced significant media coverage that further investigation may someday lead to a general non-dye treatment for grey hair. Malnutrition is also known to cause hair to become lighter, thinner, and more brittle. Dark hair may turn reddish or blondish due to the decreased production of melanin. The condition is reversible with proper nutrition. Werner syndrome and pernicious anemia can also cause premature graying. A 2005 uncontrolled study demonstrated that people 50–70 years of age with dark eyebrows but gray hair are significantly more likely to have type II diabetes than those with both gray eyebrows and hair. A 1996 British Medical Journal study found that tobacco smoking may cause premature graying. Smokers were found to be four times more likely to begin graying prematurely, compared to nonsmokers. Gray hair may temporarily darken after inflammatory processes, after electron-beam-induced alopecia, and after some chemotherapy regimens. Much remains to be learned about the physiology of human graying. There are no special diets, nutritional supplements, vitamins, nor proteins that have been proven to slow, stop, or in any way affect the graying process, although many have been marketed over the years. However, French scientists treating leukemia patients with a new cancer drug noted an unexpected side effect: some of the patients' hair color was restored to their pre-gray color. The hair color of buried bodies can change. Hair contains a mixture of black-brown-yellow eumelanin and red pheomelanin. Eumelanin is less chemically stable than pheomelanin and breaks down faster when oxidized. The color of hair changes faster under extreme conditions. It changes more slowly under dry oxidizing conditions (such as in burials in sand or in ice) than under wet reducing conditions (such as burials in wood or plaster coffins). Hair color can be changed by a chemical process. Hair coloring is classed as "permanent" or "semi-permanent". Permanent hair color means that the hair's structure has been chemically altered until it is eventually cut away. This does not mean that the synthetic color will remain permanently. During the process, the natural color is removed, one or more shades, and synthetic color has been put in its place. All pigments wash out of the cuticle. Natural color stays in much longer and artificial will fade the fastest (depending on the color molecules and the form of the dye pigments). Permanent hair color gives the most flexibility because it can make hair lighter or darker as well as changing tone and color, but there are negatives. Constant (monthly or six-weekly) maintenance is essential to match new hair growing in to the rest of the hair, and to remedy fading. A one-color permanent dye creates a flat, uniform color across the whole head, which can look unnatural and harsh, especially in a fair shade. To combat this, the modern trend is to use multiple colors—usually one color as a base with added highlights or lowlights in other shades. Semi-permanent color washes out over a period of time—typically four to six weeks, so root regrowth is less noticeable. The final color of each strand is affected by its original color and porosity, so there will be subtle variations in color across the head—more natural and less harsh than a permanent dye. However, this means that gray and white hair will not dye to the same color as the rest of the head (in fact, some white hair will not absorb the color at all). A few gray and white hairs will blend in sufficiently not to be noticeable, but as they become more widespread, there will come a point where a semi-permanent alone will not be enough. The move to 100% permanent color can be delayed by using a semi-permanent as a base color, with permanent highlights. Semi-permanent hair color cannot lighten hair. Hair can only be lightened using chemical lighteners, such as bleach. Bleaching is always permanent because it removes the natural pigment. "Rinses" are a form of temporary hair color, usually applied to hair during a shampoo and washed out again the next time the hair is washed. ^ "Change in Hair Pigmentation in Children from Birth to 5 Years in a European Population (Longitudinal Study)". Forensic Science Communications. Archived from the original on 2014-03-20. Retrieved 2014-03-19. ^ "Race". Webspace.ship.edu. Retrieved 2012-04-03. ^ "Light-colored hair can be golden for women". Chicago Tribune. Retrieved 13 April 2016. ^ Melanesian blond hair is caused by an amino acid change in TYRP1. Kenny EE, Timpson NJ, Sikora M, Yee MC, Moreno-Estrada A, Eng C, Huntsman S, Burchard EG, Stoneking M, Bustamante CD, Myles S (May 2012). "Melanesian blond hair is caused by an amino acid change in TYRP1". Science. 336 (6081): 554. doi:10.1126/science.1217849. PMC 3481182. PMID 22556244. ^ Ito, S.; Wakamatsu, K. (2011). "Diversity of human hair pigmentation as studied by chemical analysis of eumelanin and pheomelanin". Journal of the European Academy of Dermatology and Venereology. 25 (12): 1369–1380. doi:10.1111/j.1468-3083.2011.04278.x. ^ In males, the supposedly recessive trait is often expressed in parts of the facial hair or beard. Valverde P, Healy E, Jackson I, Rees JL, Thody AJ (November 1995). "Variants of the melanocyte-stimulating hormone receptor gene are associated with red hair and fair skin in humans". Nat. Genet. 11 (3): 328–30. doi:10.1038/ng1195-328. PMID 7581459. ^ "Scientists question whether rare reds are headed for extinction". Azcentral.com. 2005-05-05. Retrieved 2012-04-03. ^ "The Genetics of Red Hair: What Causes Natural Red Hair?". Brighthub.com. 2009-09-04. Retrieved 2012-04-03. ^ "Michigan twins featured in book about rare red hair". MLive.com. Retrieved 2012-04-03. ^ Weir, Sarah B. (2012-10-02). "Why does hair turn grey?". Yahoo! Lifestyle UK. Archived from the original on 2012-10-07. Retrieved 2012-11-10. ^ James, William; Berger, Timothy; Elston, Dirk (2005). Andrews' Diseases of the Skin: Clinical Dermatology (10th ed.). Saunders. ISBN 978-0-7216-2921-6. ^ "Premature Graying: Reasons, Options". WebMD. ^ Burford, Michelle (6 August 2009). "Gray Hair Myths and Facts". AOL Health. Archived from the original on 6 August 2009. Retrieved 6 August 2009. ^ Copping, Jasper (30 September 2012). "Grey hair 'less prevalent than previously thought'". The Telegraph. Retrieved 22 January 2017. ^ Giana, Bosa. "What Causes Hair To Go White? Let Us Find The Exact Reasons". gaizupath.com. Retrieved 16 February 2017. ^ "Understanding Genetics: Human Health and the Genome". Archived from the original on 2011-07-24. Retrieved 2011-07-25. ^ 鼻毛にも白髪は生えるの？ (in Japanese). Retrieved 3 July 2012. ^ Ralph M Trüeb (Jan–Jun 2009). "Oxidative Stress in Ageing of Hair". Int J Trichology. 1 (1): 6. doi:10.4103/0974-7753.51923. PMC 2929555. PMID 20805969. ^ "Research yields clues to why hair turns gray". Associated Press. Retrieved 5 August 2011. ^ Carina Storrs, Special to CNN (1 March 2016). "First gray hair gene found, plucked out of research". CNN. ^ Nsikan Akpan (3 May 2013). "Cure For Gray Hair Is Almost Here, Vitiligo Study Claims". Medical Daily. Retrieved 17 January 2016. 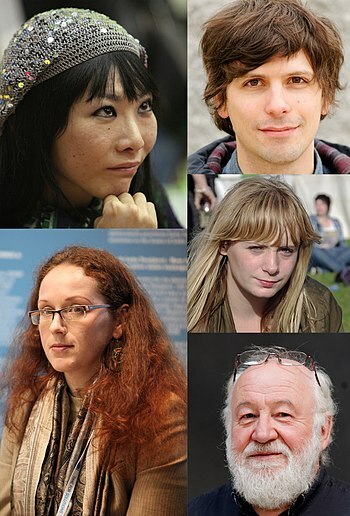 ^ Etienne, Gabriel; Cony-Makhoul, Pascale; Mahon, François-Xavier (8 August 2002). "Imatinib Mesylate and Gray Hair". New England Journal of Medicine. 347 (6): 446. doi:10.1056/NEJM200208083470614. PMID 12167692. ^ a b "Cancer drug restores hair colour". BBC News. 2002-08-08. ^ Saling, Joseph. "The Effects of Stress on Your Hair". Web MD. Retrieved 14 August 2013. ^ Ballantyne, Coco. "Fact or Fiction? : Stress Causes Grey Hair". Scientific American. Retrieved 14 August 2013. 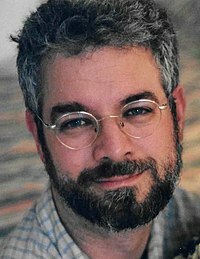 ^ Robert Preidt (17 Apr 2013). "Seriously Stressed? Hair Analysis Tells All, Study Finds". WebMD. ^ Bazian (7 May 2013). "No evidence of cure to prevent hair going grey". Filey and Hunmanby Mercury. ^ Department of Dermatology, Academic Teaching Hospital Dresden-Friedrichstadt (14 December 2005). "Eyebrow color in diabetics". Acta Dermatovenerol Alp Panonica Adriat. 14 (4): 157–60. PMID 16435045. ^ Mosley JG, Gibbs AC (1996). "Premature grey hair and hair loss among smokers: a new opportunity for health education?". BMJ. 313 (7072): 1616. doi:10.1136/bmj.313.7072.1616. PMC 2359122. PMID 8991008. ^ Cline DJ (April 1988). "Changes in hair color". Dermatol Clin. 6 (2): 295–303. doi:10.1016/S0733-8635(18)30675-2. PMID 3288386. ^ "Interactive Dig Hierakonpolis - Archaeological Hair". Archaeology.org. Retrieved 2012-04-03. ^ Aguh, Crystal; Okoye, Ginette (2016-12-06). Fundamentals of Ethnic Hair: The Dermatologist's Perspective. Springer. ISBN 9783319456959.